God as the potter who can break down Israel; it's quite a threatening image. Repentence called for. Tune In / NCYC '07 Forgive us now (Brown). “As we forgive may we be healed, as we reach out….” An excellent ballad seeking forgiveness in a sinful world. Lyrics and sound sample. Brunswick Song Project Broken (Loukes) This simple song would fit well this week as it talks about being broken (like that pot!) and leads into communion, which we'll be celebrating. It's probably not too hard to be sung the first time, particularly if the congregation are just invited to join in the chorus. God knows us better than we know ourselves. We cannot hide.God knows us better than we know ourselves. We cannot hide. 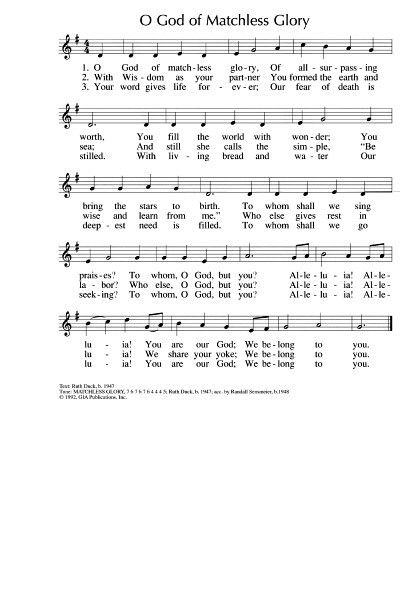 AHB 90 / PfAS139B Lord you have searched me and you know (1912 Psalter) An older style hymn based on this Psalm. I'm not crazy about it, but it might be good if you only have the AHB! Love God, follow God's commandments and hold fast to God - it's the best way, really. TiS 430 / AHB 337 / Cha324 Your words to me are life and health (Martin) I really like this old hymn. It’s a bit old fashioned, but it still works, I think. Sound sample and lyrics. *Online resource Blessed are those who trust in God / By the stream (Grundy) Oh my... this is just gorgeous! Best sung by a soloist for the verses. The recording is so beautiful - it's easy to pull my heartstrings with a cello and a mandolin... Youtube. Sheet music sample and purchasing options. *Online resource Like a tree by the flowing water (Bruxvoort-Colligan) Lovely simple words of connectedness, and a simple chorus. Good for kids. Lyrics, sound sample and purchasing options. *StS116 I saw a tree by the riverside / The Tree Song (Ken Medema) A great kid’s song about roots growing down to the water, and leaves growing up to the sunshine, and bearing fruit, and all that great stuff. Good for kids. Lyrics. *Linnea Good Strong as living Trees A lovely haunting chant. Good for kids and adults alike. *Online resource Like a tree by the flowing water (Bruxvoort-Colligan) Part of a series of songs based on Psalm 1, I think the chorus of this is probably my favourite. In Australia, you might want to use only the chorus because the word "rooted" means something quite different over here. Sound samples, lyrics and purchasing options. Good for kids. CP462 The hidden stream that feeds (Troeger) Good for the end of the service "We leave this watered place to work on rocky ground, Yet even there the streams of grace sustain our daily round. Lord, through our lives may others hear your living waters drawing near." NCH438 / UMH377 / LBW346 / ELW785 / HPP390 / GtG840 / W&R428 / Cha561 / Srce784 / MP757 When peace like a river (Spafford) An older American hymn. Hymnals vary in how old fashioned the lyrics are, and only some include the chorus. Lyrics and tune (really terrible old lyrics). PfAS001E How blest the people (Espinosa) This will take a little while to learn, but the chorus is very simple, so perhaps use a cantor to sing the verses. TiS 1 / PfAS001C Happy are they who Walk in God's wise way (Routley) Excellent tune from Thailand. Words are a reasonable paraphrase and slightly old fashioned but quite fine. PfAS001F / URW224 Happy is the one (Bell) Quite straightforward and good hymlike paraphrase of the Psalm. NCH Psalter001 My delight is in the law of God (Hunnicutt) A very simple refrain and chanted Psalm. Paul's words of greetings and words on Onesimus' return, no longer a slave. AoVK-21 Weave one heart (Haugen) Excellent song, with call and response verses "many colours woven into one"
Recorded Music Sisters & Brothers (Malcolm Gordon) A song of change, surrender and the formation of a new family "Where slaves become brothers and love is discovered...". Sound sample and purchase options. In case you didn't hear him the first time, the gospel writer is reminding you that Jesus told his followers to give up their possessions. TiS 583 / AHB 496 / NCH204 / CH402 / UMH415 / VU561 / LBW398 / ELW667 / PH393 / GtG718 / GC698 / GC(II)690 / CP431 / CP(E) 582 / W&R351 / 82Hml-675 / MP935 Take up thy cross the Savior said (Everest) I don't actually like this hymn, mainly because I don't know it very well, but lots of other people do. Some versions are quite masculine in their language, but TiS, NCH, Gather hymnals and others are OK. Lyrics with one of many possible tunes (not the TiS tune). Oldy-but-a-sometimes-goody. Online Resource / AA087 Lift high the cross (Kitchin adapt Murray) Shirley Murray's adaptation of this old hymn makes it very singable, while still challenging. Lyrics and sheet music. What other songs would work with these readings? Please join in and add a comment below. Delighted to find a vidoe of God made me as I am - https://www.youtube.com/watch?v=ATgKiPDl8nU - always good to hear things in advance especially as my sight reading skills are not well developed! It's an old one, but "Have Thine Own Way, Lord" goes nicely with the Jeremiah reading.